Hotel Helvetia. Charming boutique hotel by the river Sihl with a nice bar and above all a petite rooftop bar in summer. You can book it here. Pension Kalkbreite. Good value accommodation with nice rooms and ensuite or shared bathrooms inside the big Kalkbreite building. You can book it here. 25hours Hotel (Zürich West). Colorful 4* hotel with rooms designed by Alfredo Häberli. You can book it here. Hotel Greulich. 4* Design Hotel in one of the atelier and design districts. You can book it here. NiMo. Cosy hotel close to the State Opera with clean and pretty rooms. You can book it here. Pension für Dich. Accommodation with shared bathrooms on top of a child-friendly cafe. You can book it here. Marktgasse. Cute 4* boutique hotel right in the old town. You can book it here. Motel One. The German hotel chain has put a nice place-to-stay into Zurich‘s old post building. You can book it here. Kronenhalle. An institution in Zurich! High-class service and food. They also have a famous cocktail bar. Razzia. This old cinema was converted into a spectacular restaurant with tasty food by Erik Haemmerli. Brasserie Lipp. French food in a bistro ambiance. Lumière. Romantic French restaurant in the old town area. Their "Filet Café de Paris" melts aways in your mouth. Hiltl. 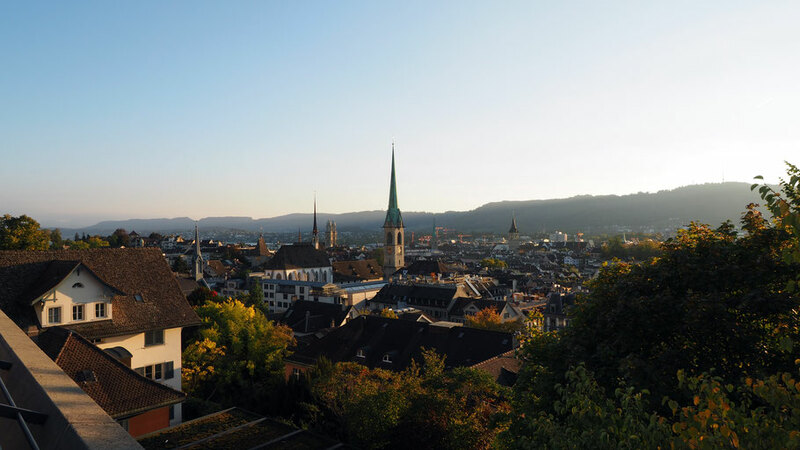 Zurich‘s famous vegetarian restaurants – try their vegetarian Tartar or Cordonbleu. Their rooftop branch on the PKZ is a cool place-to-be. Bernerhof. How about a delicious Entrecôte Double or cheese fondue in winter? Josef. Tasty restaurant, where you can order small courses and which also has a good bar. Adlisberg. Great for a little country feeling. During the venison season you just have to go there. For a cheesy Raclette / Fondue getaway take a walk – or drive – up to Chäsalp. They also offer brunch menus. Le Hall. For a luxurious timeout go to the lobby of 5* hotel Baur au Lac. They serve great snacks and afternoon tea (autumn and winter season). Ristorante Italia. Great Italian restaurant offering lunch menus and a la carte menus in the evening. Very kind service and tasty food, their home-made desserts are a must-try. Bebek. Restaurant with nice interior in the Kalkbreite Complex serving a food mixture of Turkey, Lebanon and Greece. Da Michelangelo. Italian restaurant with funny interior and great simple food. Accademia del Gusto. High-class Italian dining with classy service. Try the surprise starter platter. Z. Alten Löwen. It is fun to have a Tavolata-Menu with friends in this local pub – especially on their tree-covered terrace in summer. Giusis. For great pizzas with great names, try Sofia Loren. SO Pizza. New Pizza concept: eat slices from many different Pizzas together with a bowl of salad. There are two Neni restaurants in Zurich, both located in the 25hrs hotels. They offer modern Israeli fusion food. Best Vietnamese in town: Co Chin Chin. Urban flair, great food, friendly service, good prices. Book in advance! Phuket Thai Food. Freshly prepared original thai dishes. Miki. Our favourite Japanese Ramen Noodle Soups in Zurich. Shinsen. Good and affordable Sushi restaurant and delivery. Achi. Authentic Chinese food, served in good portions. Do make a reservation. Also check out their new branch KHUJUG. For more Chinese food and dumplings visit Lucky Dumpling or Lucky Noodle. Papa Ceviche. Peruvian restaurant, serving small plates to share, and Pisco bar – try their Pisco Mule. They offer lunch with interesting bento boxes. Brisket. Texas inspired BBQ – very tasty, especially for meat-lovers. For more Southern U.S. food check out their restaurant Yardbird- crispy fried chicken. Visit the collection or changing exhibitions of the Kunsthaus, which features a great Monet lake painting. The National Museum Landesmuseum lies right at the main station and got a new annex by architects Christ&Gantenbein, an extensive museum shop and the Spitz restaurant/bar/bistro. Visit the museum of design inside Zurich‘s huge art school complex. Museum Rietberg. Museum for non-European cultures, located in a beautiful park. Haus Konstruktiv is a museum for constructivist-concrete art featuring great contemporary art exhibitions. Watch a play in Zurich‘s theatre Schauspielhaus or at Rote Fabrik, a former factory site at the lake. They also have a restaurant with changing concerts. For an exclusive view on design furniture take a walk in the maze of Neumarkt17. Zurich has a lot of great cinemas. Ranging from big blockbuster houses like Arena to small art cinemas like the Arthouse theaters. 2017 Kosmos opened, an urban complex with cinema, bookstore, restaurant and bar – cosmic! Enjoy ice-skating or minigolf in the forest at the Dolder. Rent a free bike to discover the streets of Zurich. Visit the Zoo of Zurich with its wonderful Masoala rainforest and elephant park. They have flamingos! For beauty treatments visit one of the Schminkbar or Beauty Space branches around the city. Every summer there is a big theatre event Theaterspektakel at the lake with shows and lots of food. Every spring and autumn there is a wine tasting event: Expovina. The autumn event is presented on boats at Bürkliplatz. In summer you can enjoy food and movies in the open air Cinema at the Lake: Allianz Cinema. Every year the hip city quarters 3/4/5 organize a design weekend called Kreislauf 345. The Swiss-Chinese Chamber of Architects and Artists SCAA organizes interesting events every month. Since 2018 Zurich also has a Monocle Store with newspaper kiosk and, of course, a lovely cafe. Soeder. Cute store offering town-made soaps, clothes, furniture accessories and more. Happy shopping at Helvetas Fair Shop with fair trade products from all over the world. Charming jewelry by Evelyne-M made in Switzerland. Mixture of restaurant, flee market, summer bar and urban gardening: Frau Gerolds Garten. Other flee markets: Kanzlei or Bürkliplatz. Shopping for gentlemen: Pelikamo or Trunk. The alleys of Zurich‘s old town are full of surprises: e.g. the charming book store Never Stop Reading, Chinese tea store Shui Tang and famous traditional delicacy shop Schwarzenbach. Plaza. Club with bar, inside a renovated cinema. Raygrodski. Cocktail bar close to hip Idaplatz. Brick. Another tasty cocktail bar close to Langstrasse. George has a cosy retro chic interior and a long terrace facing the river Sihl. Cafe Lang. Stylish cafe and bar, children-friendly. Dante. Enjoy the interior while sipping on a basil smash or other cocktails. Just on the other street side you will find Total Bar. Old Crow. Loving the cosy atmosphere and Whiskey selection here! El Lokal offers an open-air barbecue at the river Sihl in summer where you can enjoy the evening sun with a drink. Volkshaus. Enjoy a drink here before or after dinner at their restaurant or a concert next door.